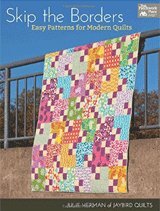 I am a beginning quilter and have always loved the look of the old-fashioned, muslin top quilts my grandmother used to make. I love to look at patterns and then come up with my own ideas, though. 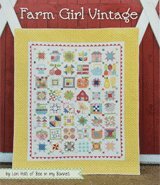 I found an antique quilt pictured in one of my books and sort of liked the design, but wanted to make it look more like me. 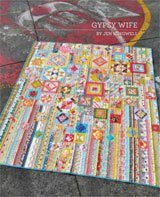 I cut the center, using muslin backing and then decided to change the medallion pattern....By the time I was through, the quilt looks very little like the one in my book, but I really love it even more because it's mine, through and through! I hung the medallion up on the fireplace mantle and looked at it for a few days, then decided to run vines and leaves around the next strips. Well....it was too much vines and leaves, so I decided to change it and run a border around the medallion. Again, back up on the mantle. I decided to run another border of the country stripes/roses between the next layer of vines and leaves, hand-sewing what ended up being 450 leaves by the time the quilt was done. Each time I finished a section, it went up on the mantle, my makeshift design wall, to see how it was going. When it got too big for the mantle, I threw it on the bed and decided what would look best for the next strip. By the time it was almost done, I decided the design was a little plain, so I added about 150 burgundy colored berries, like the one in the center, except the new berries were trapuntoed. Then I decided to machine trapunto all the leaves. Just about the time I thought this would be a never ending quilt project, it was done! Completed in July 2012. 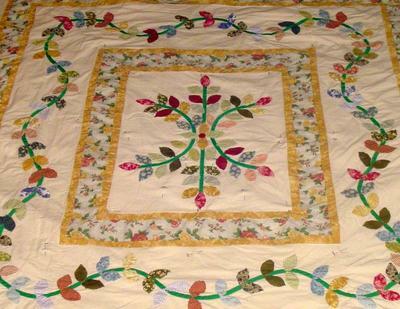 The photo was taken when the quilt was on the floor to be basted, so it looks a little messy. 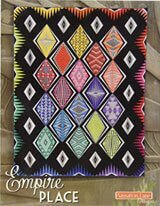 This is a great project for a beginner to learn machine trapunto, applique and machine quilting. Not to mention quilt design by the seat of ones' britches!!! My husband loves this one, but it's too warm down South to sleep under just yet. I'm really looking forward to having it on the bed this winter! Your quilt is so lovely. I would love to get a copy of the pattern for the leaves and vine for a friend who is struggling with a project I've commissioned her to do for me. Any way I could be directed on where to find it? I love your vine/leaves quilt. 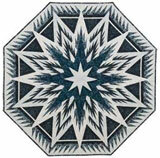 It reminds me of a quilt I made that is very similar to this pattern. I used old feed sacks for my quilt. This is very beautiful. A lot of work. Great ! It is really heart warming to see your quilt. I especially like the simplicity of the vine trailing around.